The “Hello World” example from Microsoft is quite good, so I would recommend reading it if you want a deeper explanation of each of the steps. However, I would like to take this opportunity to show you specifically how to create a Touch Bar extension for a MacBook. 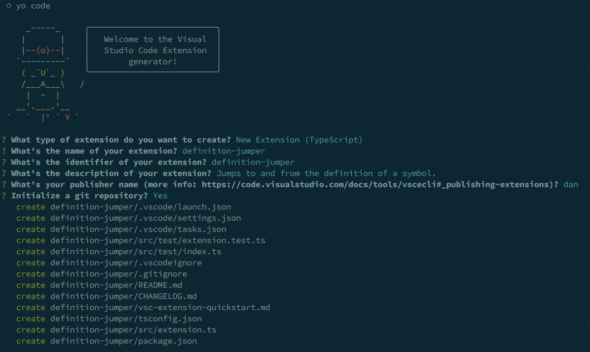 The VS Code team has kindly created an extension generator, which will create the necessary files and folders, including the Hello World extension source code, package.json, launch.json, and tasks.json for additional convenience. This will open the Yeoman interface and allow you to choose a few options for your extension. I just went with the defaults for the next several prompts, but enter whatever you would like. cd to the directory, perform an “initial commit” if desired, and open the directory in VS Code. If you have VS Code CLI in your path, run code . to open the current directory. Now that we have the project open, take a minute to explore its structure. src/extension.ts is where we will implement our extension. package.json is where we will declare the extension and the capabilities. As you can see, the architecture of an extension is quite simple, although I haven’t worked on any large-scale extensions myself. To run the application, press F5 (or the Play button on your Touch Bar). This will start a debugging session in the current VS Code window, where you can set breakpoints and see console output. 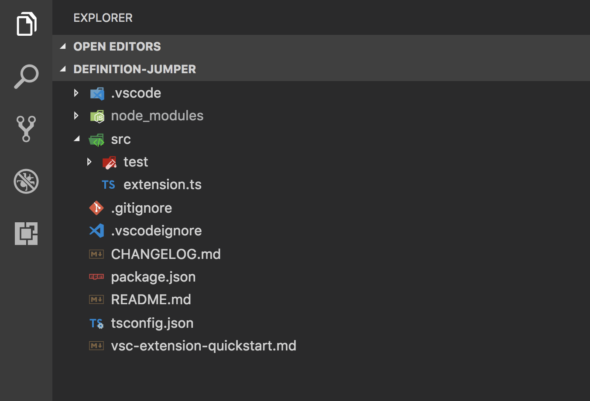 It will open another VS Code window (the Extension Development Host) with the extension active. The “Hello World” extension can be run be opening the command palette (CMD + SHIFT + P) and typing in “Hello World.” Now we’re ready to write our own functionality. As I mentioned earlier, I would like a way to jump to declaration and back quickly. Let’s begin by adding the functionality to jump to the declaration. If you’re still debugging the extension, reload the Extension Development Host window. Otherwise, run the extension again. Since we didn’t change the way the functionality is activated, we will still have a “Hello World” command available to use. If you move your caret above a symbol and run the command “Hello World” again, rather than seeing a message pop up, you will jump to the declaration of the symbol. Since our goal is to create a Touch Bar extension (and this is a pretty weird way to jump to the definition), let’s change how we invoke our action and add a button on the Touch Bar. right after commands in the contributes section. This will add a button with the text “Hello World” to the Touch Bar. Let’s take a moment to get rid of the “Hello World” text and rename the “sayHello” action to “jumpTo” in both package.json and extension.ts. Now, we can create a “Jump Back” button. Feel free to copy the “Jump To” declaration and implementation in the package.json and extension.ts, respectively. Replace the “JumpBack” command with workbench.action.navigateBack. Don’t forget to add it to the subscriptions as well. Let’s take this a step further by adding some icons. One option is to replace the title in package.json with unicode characters or emojis, but I would rather use a custom icon. Find or create two icons (feel free to use mine that I quickly created in Sketch). I would recommend PNGs for the transparent backgrounds. Following Apple’s guidelines, center the square icon and make it 60% of the full image. Create a directory called “assets” in the root of your project. Move the PNGs to the assets directory. Add the paths to the icons below the titles for each button in the package.json. Now, when you fire up Visual Studio Code, you will have two buttons that will jump to the definition and back. Thanks! Easy to follow and complete!